There’s a breakfast feast accumulating on your little wrought-iron table. Yogurt parfait covered with granola and colorful berries. Still-warm blueberry muffins. Plus mugs of steaming-hot coffee. 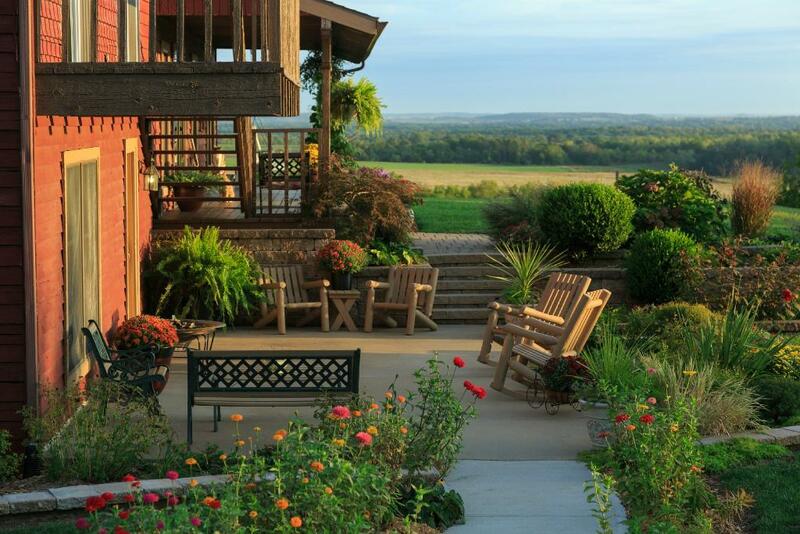 You stare out at the terrace, the blooming gardens, and the rolling hills while you pick at the first course. The already warm sunshine above is promising a hot afternoon. It’s a pretty morning in the Kansas countryside. Then your breakfast entrée arrives. A smoked brisket quesadilla served with chunky, roasted vegetable salsa and sprinkled with fresh cilantro. You momentarily forget about the peaceful setting around you. You don’t return to your senses until you devour the quesadilla. The whole quesadilla. All that’s left on your plate is a few cilantro leaves and some tomato juice showing where the salsa once sat. As promised, breakfast at Cedar Crest Lodge is both delicious and unique. Now you get to spend the rest of the day following the trails over the lodge’s 100 acres, sitting in Adirondack chairs by the ponds, eating a picnic lunch on a garden bench, swimming in the pool, taking a late-afternoon nap in a hidden hammock, playing bocce ball or throwing horseshoes, and making s’mores in the fire pit. Cedar Crest Lodge is in Pleasanton, Kansas. The easy-to-miss town lies one hour south of Kansas City along the Missouri border. Historically, it’s known as the place where the Union soldiers stopped the Confederates from advancing into Kansas. General Alfred Pleasonton’s troops won a decisive victory in the 1864 Battle of Mine Creek. The town was named after him, with a slightly different spelling, when it was established five years later. The Mine Creek Battlefield State Historic Site, located southwest of the center of town, now offers exhibits and talks about the battle, and its importance in the Civil War. But, if you’re being honest, you didn’t drive to Pleasanton to tour the battlefield. Sure, you might stop by, but it was by no means the focus of your trip. You were just looking for a quick Midwest escape. 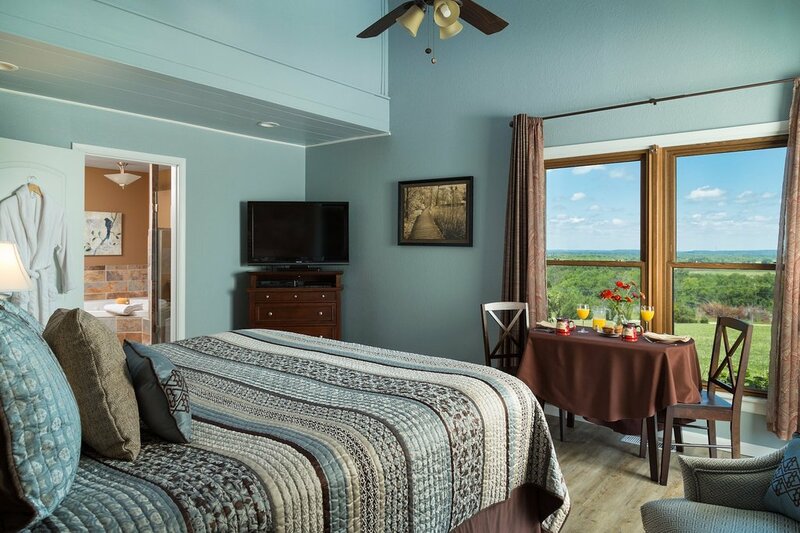 You wanted gorgeous scenery and a comfortable room. The two-person soaking tub in the Country Meadow Room certainly helps. And you required good food. Cedar Crest Lodge’s fresh-from-the-garden vegetables—including more than 30 types of heirloom tomatoes—and extraordinary breakfasts certainly fit the bill. You’re already trying to decide whether you should request warm pumpkin pancakes or redo the quesadilla tomorrow. Either way, it will be another morning feast.